Princess Cut. Rest assured that I will always make them right. Sorry, I don't have any certificates. 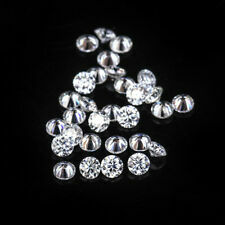 Carat Weight : 0.15 Ct. MM Size : 3.58 X 2.01 X mm. Shape : Round Cut. The Side stone is simulated diamonds. These diamonds are in every respect like natural diamonds except hardness. Country/Region Of Manufacture: India. They both look amazing but my gf liked the round style more for the custom ring I had made for her. Shape: Round Brilliant Cut. Polish : Excellent. Color: pink. Hardness: 9.25 on Mohs scale. Cut Grade: Excellent. Carat Weight : 0.06 Ct. MM Size : 2.43 X 1.48 mm. Shape : Round Cut. The Side stone is simulated diamonds. These diamonds are in every respect like natural diamonds except hardness. Country/Region Of Manufacture: India. 2 Carat 8.0mm Round Brilliant Cut Off White H Color VVS Moissanite Loose Stone. Condition is Pre-owned. Shipped with USPS First Class Package. 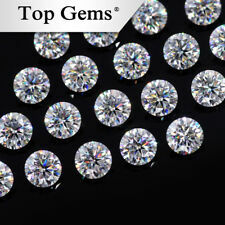 Our stones have outstanding quality and they are full of sparkle! CLARITY: VVS. CARAT WEIGHT: 1.0 ct. - It will not look like a piece of rock salt, like cubic zirconia, after two weeksBe sure to hit "favorite" on the right so it remains in your favorites list and/ or add to your wish list(s). 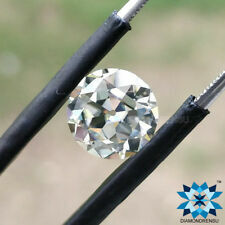 Carat Weight : 2.28 Ct. MM Size : 8.71 X 5.41 mm. Shape : Round Cut. The Side stone is simulated diamonds. These diamonds are in every respect like natural diamonds except hardness. Country/Region Of Manufacture: India. Color: greenish Blue. Shape: Round Brilliant Cut. Polish : Excellent. Hardness: 9.25 on Mohs scale. Cut Grade: Excellent. While it is a very pretty stone, it isn't quite as clear as the Marquise. A very slight yellow color. VERY SLIGHT. You aren't really able to see it, unless you are holding it next to the other stone. Carat weight -:-. STONE SPECIFICATION :-. - Round Cut. BEST CUTTING AND POLISHING AT OUR OWN FACILITY. We are 40 years old manufacture in all type of jewelry and loose diamonds and gemstones. Color Missanite. 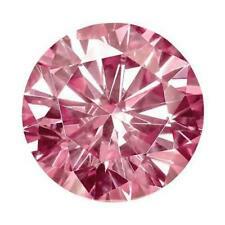 Carat Weight : 3.57 Ct. MM Size : 10.48 X 7.57 X 4.84 mm. 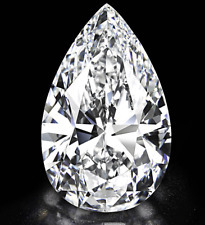 Brilliance/Refractive Index: 2.65 ( Better Than Mined Diamond's 2.42). The Side stone is simulated diamonds. These diamonds are in every respect like natural diamonds except hardness. 2 Carat 8 mm GH Loose Moissanite Stone Brilliant Round cut by Diamondrensu...they have a 100% rating on EBay and this moissanite was custom cut using Adamantine Luster moissanite the highest quality available so it mimics the fire and look of a diamond. No picture can actually capture its beauty. The cut of this gem is excellent! It will not disappoint! Carat Weight : 2.31 Ct. MM Size : 8.99 X 5.12 mm. Shape : Round Cut. The Side stone is simulated diamonds. These diamonds are in every respect like natural diamonds except hardness. Country/Region Of Manufacture: India. Our stones have outstanding quality and they are full of sparkle! CLARITY: VVS. CARAT WEIGHT: 2.0 ct. - It will not look like a piece of rock salt, like cubic zirconia, after two weeksBe sure to hit "favorite" on the right so it remains in your favorites list and/ or add to your wish list(s). Shape: marquise Brilliant Cut. Hardness: 9.25 on Mohs scale. Cut Grade: Excellent. Color: White (H-I). Carat Weight : 2.83 cts. Country Of Manufacture : India. ·It will not look like a piece of rock salt, like cubic zirconia, after two weeks. Brilliance/Refractive Index : 2.65 (Better than Mined Diamond's 2.42). Brilliance/Refractive Index: 2.65 ( Better Than Mined Diamond's 2.42). Color : Brown. The Side stone is simulated diamonds. These diamonds are in every respect like natural diamonds except hardness. Keep in mind that I use a macro photo lens to capture as much detail as possible. This exaggerates even the tiniest flaw or chip. I think it could use a good cleaning.695 CARAT. Rest assured that I will always make them right.